I’m a huge fan of shark movies, but what some directors in this genre are pawning off on their audiences is pure cheese & tripe. Thankfully, that’s not the case with Kimble Rendall’s Bait. There were a few relatable characters to cheer for as well as loathsome and irritating ones that you wanted to see the sharks devour! Raw and wriggling as Gollum would say. The acting was above par for this genre, the pace was even and shots well done. The story had background without getting too overwhelming, lots of emotion without falling into melodrama. It even had a original attacks on the sharks *grins* though I won’t say what they are – I have a No Spoiler rule in my reviews. My only two complaints are that one of the irritating characters that I wanted to see ripped to wee bity shreds survived and some of the graphics at the end were shaky. I didn’t mark this movie down for those however, as I think they did a stellar job with the budget that they had. 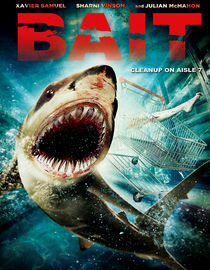 A must see for any creature feature or nautical beasty fan!